John Walkup - California Consulting, INC. 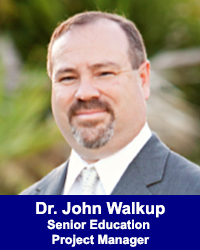 Trained as a professional technical writer, John Walkup has authored a wide range of successful grant proposals, focusing most of his efforts on school-related projects. Over the last four years, John has helped California public agencies retrieve over $18 million in grant funding. John has taught physics at the high school level and mathematics, multimedia arts, and English at university level. His expertise spans such topics as STEM learning, English Learners, curriculum development, classroom observation, professional development, standards alignment, and curricular rigor. In 2007, he co-developed the concept of cognitive rigor and the Cognitive Rigor Matrix (also called the Hess Matrix), now used nationally to gauge the quality of curricular content. In 2008, he led the two largest studies of curricular rigor ever performed in this country. John earned his Doctor of Philosophy studying theoretical physics at the University of Oklahoma.